The Iron Skeptic - The King: Dead or Living in New Jersey? There are two Kings: Elvis, the King of Rock and Roll, and Michael Jackson, the King of Pop. If you need any commentary on the state of the world today, there it is: our kings have fallen from hunky songsmiths to child molesters that could not get creepier if they tried. Though exact numbers are difficult to come by, it is estimated that Elvis has sold one billion records globally. This is more than any other musician could ever dream of selling and, despite the fact that Elvis sang only in English except for on some movie soundtracks, at least 40% of his sales have been from outside the United States. He had 18 number one chart-topping hits, and they spent a combined total of 80 weeks there. He starred in 31 films and in 1967 had a televised special from Hawaii that was watched by more people than mankind’s first steps on the moon. Suffice it to say that Elvis earned the title of King. These new musicians that all the young people like, with their baggy pants and their rock and roll devil music, couldn’t hold a candle to him. But, sadly, there was a down side. Elvis grew disillusioned, gained a lot of weight, shot a hole in a television when a show he disliked came on, and in 1977 was supposedly found dead on the toilet. Under the incredible amount of pressure that only rock stars and skeptic authors can really ever be under, Elvis started eating pills. It began with medication that his mother was taking, and eventually he’d eat any pills that he could come across, including, in one incident, opening a bottle of Bayer aspirin and eating all of them. Couple this with his terrible eating habits (he loved those fried peanut butter and banana sandwiches, and with good reason – they’re delicious) and you’ve got a recipe for disaster. Originally, his cause of death was listed as heart attack, but the doctors eventually changed their story and claimed that they lied to keep from tarnishing Elvis’ image. According to the second version of their story, it was actually a drug overdose. So what evidence do we have to suggest that this story isn’t true, that Elvis did not get so stressed that he ate pills and bad food until his body gave up on him? It’s all circumstantial, but conspiracy theorists have gained adherents with much less going for them. The alternative to the 'Elvis is Dead' theory states that, under such enormous pressure, Elvis faked his death, escaped under an assume name, and quietly lived out the rest of his life somewhere. First is the question of his death. The doctors at first stated that the reason for the 42 year old King’s death was a heart attack; they later claimed under pressure that they had lied. Supposedly, they also performed an autopsy on Elvis, however, if these two were the kind of people that would lie about a cause of death, how can we be sure that they’re not the kind of men that would lie about performing an autopsy? The evidence for or against Elvis being dead in this area of the story is inconclusive. It’s just a question about whether or not you believe two admitted liars when they claim to have committed an autopsy. Perhaps they lied about Elvis actually being dead so that he could escape and live in peace; I can't see much difference between that and lying about a cause of death to keep from tarnishing his image. Second is Elvis’ casket. Many have claimed that, in the coffin, Elvis didn’t look quite right, leading to speculation that the body it contained was not, in fact, Elvis’. On the one hand, who does the same in a casket as they do alive? I’m no mortician, but I think the discrepancy between appearances can be explained without resorting to a ringer. A dead ringer, if you'll forgive the pun. Also, JD Sumner, a former backup singer and bass player that performed with Elvis, has said he’s certain that the body in the coffin was Elvis’. This boils down to a question of whether you believe him, or whether you think he’s lying to help out his friend. In other grave-related news, there’s the matter of Elvis’ gravestone, shown beneath this paragraph. His body was moved back to Graceland for ‘security reasons’, where it was re-buried under the name ‘ELVIS AARON PRESLEY.’ Unlike myself, Elvis spelled his middle name with only one a, ‘Aron’ rather than ‘Aaron’. 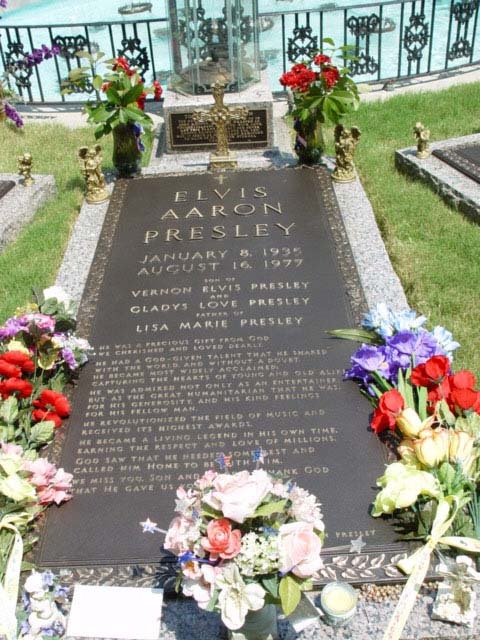 The tombstone was custom-ordered by Vernon Preseley, Elvis’ father. Why would he order a gravestone without spellchecking it, much less let it stand for almost three decades? Because Elvis is an honest man, and doesn’t want his name on a grave that doesn’t contain his body. For circumstantial evidence, this single piece is pretty strong. But how, you ask, would Elvis have been able to fake his death and live out a life of solitude under a different name? Well, in show business, it’s all about your manager. 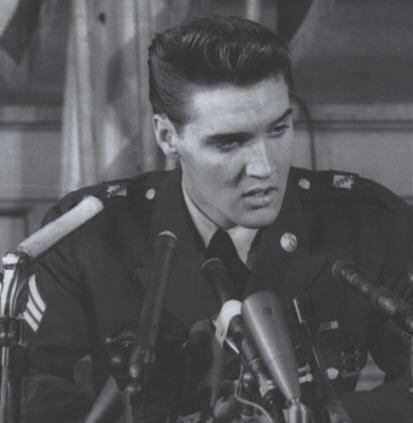 In Elvis’ case, his manager’s name was Tom Parker, generally called The Colonel, since he had been given the honorary title of Colonel by several southern governors. (Bonus personal side note: my father is a Kentucky Colonel. Appointing Colonels is, apparently, just a Southern thing, like pork rinds and mint juleps.) In reality, The Colonel's name was Andreas Cornelis Van Kuijk, born in the Netherlands. At age 20, some claim that there is evidence he bludgeoned a woman to death and fled to America to escape justice. Whatever his reason, there is no question that he was an illegal alien who, as he moved through America and eventually became one of the most influential music promoters in the country, left no paper trail. There is no official evidence that this guy ever lived in the United States. Who better to have on your side if you’re trying to set up a new life? Elvis definitely had motive, and the Colonel had the ability to make it a reality. The response to this fact is that Elvis was worth more to Colonel Parker alive than dead, and knowing Parker’s personality, he’d never do anything to remove his star from the limelight. On the other hand, Elvis has consistently made Forbe’s list of highest-paid dead entertainers: in 2006, he earned about $22 million. Maybe the Colonel was convinced that Elvis dead wasn’t really as bad as it would seem at first. So what evidence do we have? Elvis wanted out of the spotlight. He looked odd in his coffin. The surgeons who claimed to have performed his autopsy and determined his cause of death have said some things that make them untrustworthy. His tombstone is egregiously mislabeled. Elvis’ manager would have more than had the ability to set The King up in a new, anonymous life. To me, it seems like an even split. There’s about as much evidence that Elvis is alive as there is that he is dead. The only way that the question will ever be settled would involve genetic testing of the body in Elvis’ grave, if there is one. Although I’ve advocated a lot of insane things in my day, I have yet to advocate grave robbing in the name of science, and this case is certainly no different. We will never know whether or not The King has left the building. But I do know that if he is in fact alive, he wouldn’t want us nosing around too much, so I’m not going to press the issue. I put my money on him having a place in New Jersey, if he's alive. If there were ever a place for a middle-aged white guy to disappear, it's the Garden State. First Published in The Triangle, 17March 2006. Image of Elvis' tomb courtesy simonsdiary.co.uk.